This is the first time I heard of a cooling sheet mask containing liquid ice and the first time I heard of the brand Moonlab. 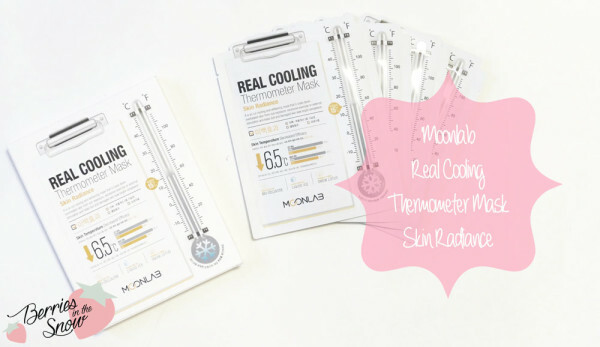 The Moonlab Real Cooling Thermometer Mask for Skin Radiance is a Bio-Cellulose Mask with dual functionality of whitening and wrinkle improvement. The brand Moonlab is a Korean brand, but is was absolutely new to me until now. There is an official webpage called PureskinWorld were you can find Pure Skin and Moonlab products, but for Moonlab there are only the Real Cooling Thermometer Masks which are available in three different versions, the Moisture Supply, the Nutrition Supply and the Skin Radiance Mask. 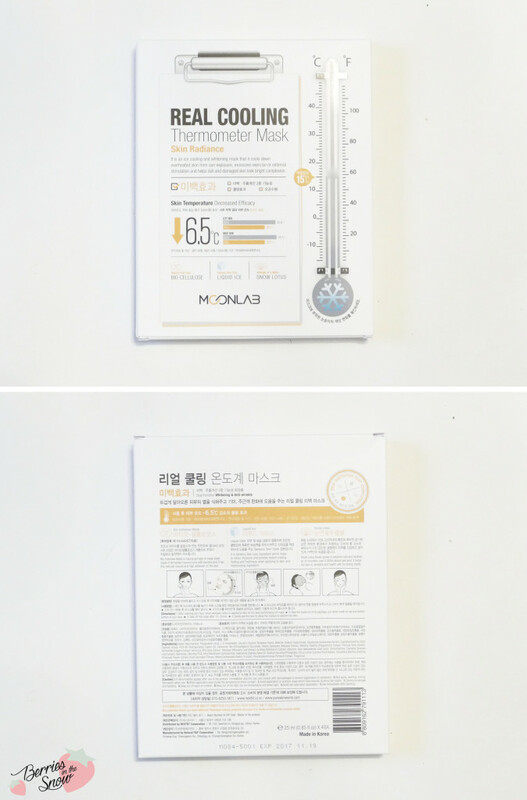 I will show you the Moonlab Real Cooling Thermometer Mask Skin Radiance Mask in this post. As said before, the Skin Radiance mask is directed towards Whitening and Anti-Wrinkle. It is an ice cooling mask that cools down skin which is overheated by sun exposure, excessive exercise or external stimulation and helps to make the skin less dull and more radiant and bright. The ingredients of the Moonlab Real Cooling Thermometer Mask are great, too. According to COSDNA all the ingredients are safe to use. You can have a look here for all the ingredients of this mask, but the list is also written in English on the sheet mask packaging. The two key ingredients are liquid ice and snow lotus extract. 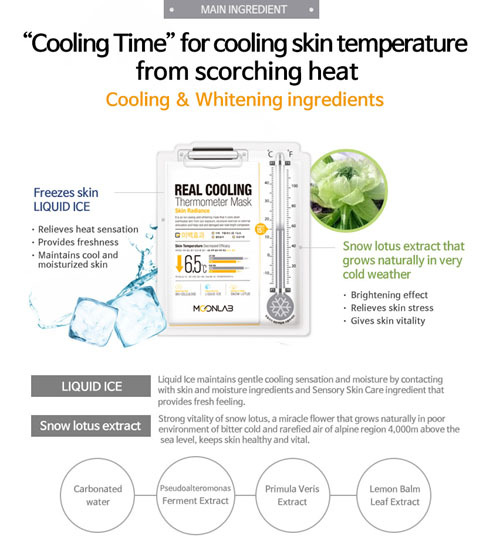 The liquid ice is responsible for the cooling effect and refreshes your skin. 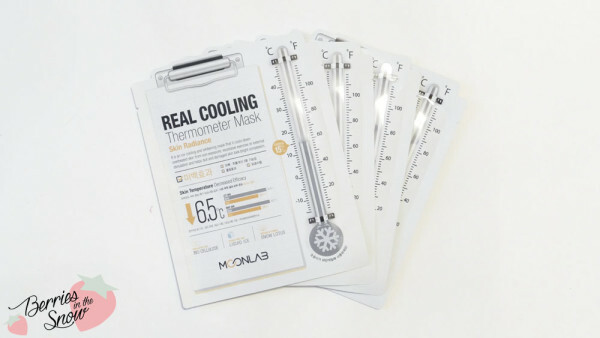 The Moonlab Real Cooling Thermometer Mask for Skin Radiance has a skin temperature decreasing effect of 6.5°C! Snow lotus extract has brightening and relieving properties. Apart from these two ingredients there are a bunch of other ingredients worth mentioning: Niacinamide for brightening, Hyaluronic Acid and Pseudoalteromonas Ferment extract for moisturizing, and even snail secretion filtrate for its anti-inflamatory effects. Also, there is a stable, water-soluble form of vitamin C that functions as an antioxidant (Sodium Ascorbyl Phosphate) in the ingredients list. Last but not least, a whole bunch of plant ingredients build up the rest of this mask! I probably do not have to mention how much I liked this list of ingredients! The sheet masks come in a cardboard box containing 4 sheet masks packed in separate sachets. The sachets have a thermometer displayed on the right side, which has a thermal indicator function. 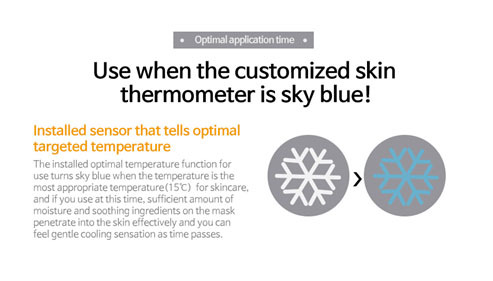 When the temperature of the mask is 15°C or less the symbol changes its color from silver to blue and indicates the perfect temperature for using it. But that’s only optional, but really a funny idea. Apart from that the design of this sheet mask is very medical/scientific, with a clipboard illustration and the bars showing the effect of the temperature decrease. The Moonlab Real Cooling Thermometer Mask is a bio-cellulose mask, a gel type mask sheet made of fermented coconut juice with bacteria. It adheres very neatly to the skin and doesn’t slip around like some hydrogel masks for example. I really like how soft and jelly it feels nevertheless. Due to the fact that the sheet masks are made of bio-cellulose the thickness of the sheet may vary because it is made from fermented coconut water. The bio-cellulose mask is protected by a plastic paper from one side and a cotton type sheet on the other. The essence is a clear type with a fluid, but not completely watery texture. It has a mild scent, which is on the flowery side, but I couldn’t define it properly. You can use the mask for 10-30 minutes, but even after 30 minutes it still has its cooling sensation. And yes, the cooling sensation is really more obvious than with regular sheet masks! You really feel how your skin tightens up from the cold. Afterwards the skin feels brightened and vital and refreshed and really softened! I really loved using this mask and apart from the 3CE Water Wrapping Facial Mask, this has become one of my favourites! I can imagine that this mask is super great for hot seasons and weather, but also after exercising. I used up 3 of these already and saved one…A pity the box comes only with 4 pieces of this mask and the retail price of 26000 Won (around 26 US$) makes it quite an expensive mask, too. But I’d say it’s worth the money! I couldn’t directly see any longterm effect considering whitening or anti-aging with only three masks, but it has definitively a direct tightening effect because of the cooling..and it contains Niacinamide and vitamin C, so the chances are good that it does a tiny bit of anti-aging and brightening, too. Nevertheless, I would like to try the other versions of the Moonlab Real Cooling Thermometer Mask! Did you try a Bio-cellulose mask before? did you know about the brand Moonlab? Just as a short reminder: All products mentioned and reviewed on this blog are of my personal opinions. This product here was sent to me for reviewing purpose by http://www.bntnews.co.uk/ which doesn’t influence me in providing my honest opinion on the products. Very cool! And I love biocellulose..
Lol.. we have a beer company that does the same thing with their packaging. When it’s cold enough to drink the can changes color. That sounds good! In fact you said it will be great for people who lives in hot weather making me tempted to try this out!